My main objective is to encourage greater use of statistical techniques in the service sector and present new ways to implement them. In a previous blog, I presented an approach you can use to identify process steps that may be improved in the service sector (quartile analysis). In this post I'll show how nonparametric distribution analysis may be implemented in the service sector to analyze durations until a task is completed. Knowing how much time you need to complete a task may be very useful when assessing process efficiency, and is an important factor in many businesses. 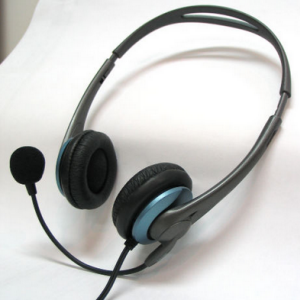 Consider a technical support department (for example Minitab technical support). Queries from users, customers, and potential customers arrive by e-mail, web, and phone calls to operators or specialists. Most of these queries are standard ones and will be answered quickly (depending on the efficiency of individual operators, of course). But a few queries are much more complex or unusual. These may require referral to another specialist, more research, or additional help from colleagues. So two modes are likely to be observed in this support department: the usual, standard mode (quick answers, low variability), and a mode for more unusual and complex queries (more time needed, large amount of variability). Another example is the time it takes a car to repaired at a mechanic's shop: some parts that are rarely required might not always be available in the shop. When unusual parts are needed, it leads to substantial increases in repair times. Any company that handles customer complaints and monitors the time it takes to resolve each incident also might be interested in analyzing durations. How can we quantify the customer experience ? The mean (or the median) is not really representative in this context: durations do not usually follow a normal distribution. Instead, we are dealing with bi-modal distributions: some customers will receive a quick response, and others will need to wait a lot longer because their problems are more complex or have never been encountered before. We could focus on the largest durations (considering the maximum value, the 95th or the 99th percentile), but these statistics are not really representative, either. Ideally, we would like to have a global view of durations until completion, in order to compare several areas, branches, teams, services, etc. An additional advantage of nonparametric distribution analysis is that censored values may be analyzed as well. For example, in a technical support department, a censored value might typically represent a user who reported an issue and received a suggestion, but never returned to confirm it worked. In this case, you cannot be really sure that the problem has been successfully solved and that the incident can be closed. In the survival plot below, the Y axis represents the number of requests that have not been completed yet (outstanding tasks, percentage of customers who are still waiting for their request to be dealt with) and the X axis represents durations/times. Clearly branch C needs more time than Branch A or B. The green curve for Branch C reveals that most requests (the easy ones) are satisfied within the initial 20 hours, but the remaining requests take a lot more time, with a maximum duration of 100 hours. Notice Branch C's very fast reduction (steep slope) at the beginning and its substantial deceleration after 20 hours. In the cumulative failure plot below, the Y axis represents the percentage of tasks (customer requests) that have been successfully completed (proportion of resolved issues), and the X avis represents duration/time to resolve an issue. 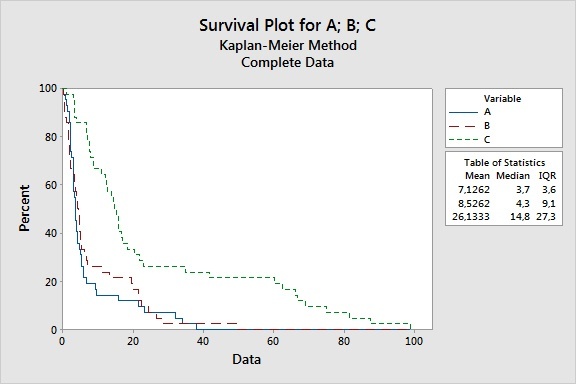 The cumulative failures plot and the survival plot convey exactly the same type of information. If you'd like to try this yourself, you can download the Minitab project file containing the data. 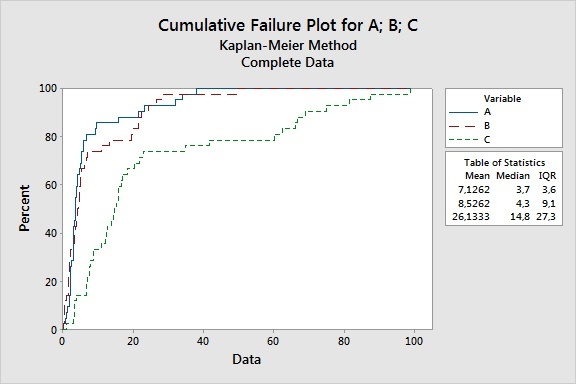 Nonparametric distribution analysis is usually used to analyze reliability data, but now you've seen how this tool can be implemented for a completely different purpose.